The history of the Seminole tribe can be compared to that of America. Just like us, the Seminoles are a melting pot made up of many Indian tribes such as Creeks, Miccosukees, Hitchitis, and Oconees that grouped together in the 1700s. Weakened by war and disease, the native people of Florida banded together with members of these other tribes who Europeans had forced south from their homelands to form the Seminoles. Although a large number of Seminoles ventured to Oklahoma to settle, many stayed in Florida. They actually settled in northern Florida but later moved south into the Everglades. They spoke English, Miccosukee, and Creek. The Seminole children went to school and helped around the house everyday. Just like any other stereotypical Indian tribe, the Seminoles enjoyed hunting and fishing with their fathers. 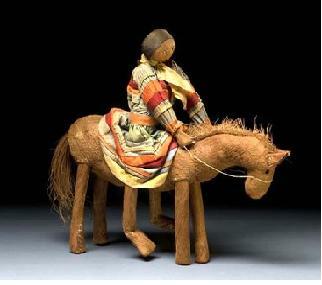 Little girls collected palmetto dolls and wooden toys while teenage boys like to play stickball. Both men and women participated in storytelling, artwork and music, and traditional medicine. They lived in houses called chickees which were created from wood and plaster and the roofs were made with palmetto fiber. Once they settled in the everglades, they began to live in smaller groups and building their house on wooden stilts that raised the floor a few feet above the ground to protect their homes from flooding and swamp animals. Seminole men wore breechcloths and women wore skirts usually woven from palmetto. 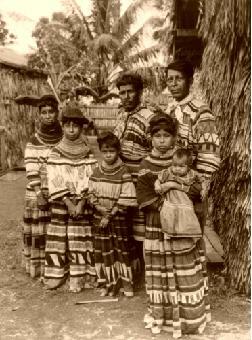 Shirts were unnecessary in Seminole culture but sometimes poncho style mantles in cool weather were worn. There were no headdresses worn like the stereotypical Indian tribe; instead men usually shaved their heads except for a single scalplock and women wore their hair long in buns. Seminoles were extremely traditional and followed all of their culture’s customs. Therefore, they got elaborate tribal tattoos but never really painted their skin. Seminole folk songs were sung to treat the sick and injured or to encourage animals to be hunted. Many believe that the Seminoles actually learned to speak English by listening to the southern dialect in the songs on records. They also listened to music such as “cowboy songs”. Hunting songs were a cappella and call and response. A capella meaning a solo or group vocal without instrumental sound and call and response meant a form of spontaneous verbal and non verbal interaction between speaker and listener. The two major ritual dances were the Corn Dance, held in June, and the Hunting Dance in October. The Corn Dance in the Cypress Swamp was recorded by Charlie Billie, the leader of that group, and Panther, who is an important part of this particular musical festival. Billie Stewart, leader in the Cow Creek group described its customs and recorded the songs. In both groups, the leaders were supposed to fast for a day before, opened with the Buffalo Dance. The Hunting Dance was supposed to “secure success on the hunt” by holding numerous social dances and is held every four years. In the Corn Dance, only the leader and his helper sing the opening ceremonial songs and go on to perform the Bird Dance Song. Each festival lasted three to four days and people came from large distances to attend them. During the festival, g-d were honored and thanked with music, laughter, dance, and food. People came to meet other clans; however, it was forbidden to marry someone from your own clan. The huge festivals were an opportunity to meet people and develop strictly friendships with other clans. There were also many other informal dances throughout the year or seasons. Many dances were connected with an animal spirit such as the snake dance, crawfish dance, and the very imperative alligator dance. Not only did the Seminoles sing and dance to music for ceremonial rituals and social dances, they found other reasons to sing such as in children dances, treatment of the sick, success in ball games, and more. “It was said to be one song but Indians frequently fail to distinguish between a song and a set of songs that are called ‘one singing’. All in all, the Seminole tribe was extremely traditional in that they followed many customs. Throughout history, the Seminoles portrayed the major significance for music and dance by celebrating success, singing in ceremonies, and more. Americas, Native Languages of the. Seminole Indian Fact Sheet. 1998. 30 march 2011 http://www.bigorrin.org/seminole_kids. Daily Life in Olden Times for Kids Everglades Seminole Indians Music. 2 April 2011 Retrieved from: http://nativeamericans.mrdonn.org/southeast/seminole/music.html. Densmore, Frances. Seminole music. 1999. 10 april 2011. Retrieved from http://fulltext10.fcla.edu/cgi/t/text/text-idx?c=fhp;idno=FS00000025;sid=b4e13b189879a166524bc9ecc6ce3c2d;rgn=full%20text;view=toc;cc=fhp;subview=fullcitation;node=FS00000025%3A1;a=37. Seminole Native American music is so important to their culture. 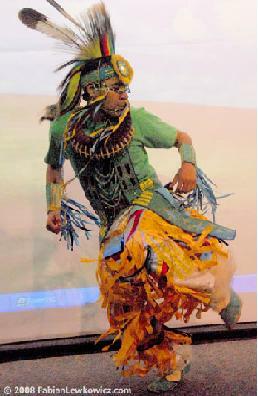 One way music is significant to their culture is how they sing and dance to connect with animal spirits such as the Snake, Crawfish, and Alligator dance. The Seminole folk songs were sung to treat the sick and injured and had many different types of songs with diverse melodies and rhythms. The night before the Seminoles wanted to hunt, they would sing hunting songs to make the animals “feed close in” so it would be easier for them to hunt them. This portrays the importance of their music, which helps them eat to survive. When Seminoles got married the Catfish song and dance are performed. Another way music is involved in their culture is when somebody is punished for breaking their morals for example murder. Their relatives kill the offender and then the person’s punishment is delayed until the next corn dance in June. They revolve a lot of their decisions and customs around music and Charlie Billie recorded many of the songs already stated. Depending on the time of day and the circumstances, different pitches and tempos were recorded which gives variety to the melodies and are an interesting phase of thematic treatment. The Alligator dance along with its recorded songs by the leaders of Cypress Swamp and Cow Creek groups are the most important songs to the Seminoles. This dance was given at night in hope that the dead would come alive in the animals one day and talk like people. Parents start their children out at a young age to start dancing to music making dances of their own. Songs are also sung in order to promote success at ball games. The Creeks would paint their faces red earth and did the Stomp dance during a ball game that was said to “make them look like giants and gave good luck”. Two songs were recorded during the relocation of the Seminoles to Oklahoma. This was part of a huge transformation for the Seminole Indians, which remains significant to their culture and who they are today. There is a Seminole festival celebrated by the Creek Indians that lasted four to eight days consisted of song and dance after they washed themselves in the stream making them feel clean inside and out and then were forgiven by the Great Spirit of their wrong doings. The music showed them they were allowed to celebrate after the festival after going through their cultural process of forgiveness. Art is really important to the Seminoles and is shown through the Green Corn Dance during fire making but are only allowed to make fire if this dance is present at the beginning of the process. Lastly, Seminole Indians speak two different languages, Creek and Miccosukee. All the songs are sung in these two languages and without this aspect of their culture, the music would not be as significant and diverse. So many different morals, customs, beliefs, art, and the Seminole ways of life are presented with Seminole music that conveys how important music is in their lifestyle and really makes them unique and who they are today. Generally, there are multitudes of themes that are prevalent in Seminole music. The most obvious of which is nature. There is no denying Seminole, and Native American in general, interest in nature and its continual appearance in their culture overall. It is not hard to understand; Native Americans lived off the land and took much from nature to aid their own survival. Their appreciation of nature and the importance it held in their life had no bounds and nature reared its head in every possible place it could in Seminole Culture. Three of the main songs among Seminoles tribes: the songs of hunting, agriculture and those for the sick, all revolve around an appreciation of nature. From singing to the animals asking them to become easier to hunt, to a song to cure sickness from a man every song has a strong tie to the natural world and represents an idea of mutual reciprocity and an understanding between man and the environment surrounding. Reciprocity and assistance are major themes in Seminole music; the songs are utilized for necessities in daily life. Hunting songs are sung to the animas asking them to become easier to hunt, as briefly explained earlier. Agricultural songs, like the Corn Dance, are sung for hope of plentiful harvest, in a similar vein a Hunting Dance is performed. Songs for the sick are sung in hopes of curing or helping with aid of sick tribe members. They also had songs they sang before their “ball games” as well as numerous others in conjunction with furthering their existence somehow. Most, if not all of these songs had an understanding of a cyclical nature to the world. The Seminoles would make a sacrifice of some kind and in return nature would be good to them. In a very odd way, the Seminoles would “pay” the Earth to allow them to survive. Seminole music, while it did have its social implications, was massively used as a ritual to bring about good fortune or provide strength when necessary for their duties. Seminoles’ belief in spirits and the power of nature provided a basis for what they were to sing and their connection with the Earth is conveyed beyond just the music. For instance when Susie Tiger, writer of many Seminole songs, was asked about a song for the sick she relayed that it “is about sand” and in conjunction with the singing a reed is to be blown over the place of ailment. For the Stomp Dance song, recited for stick-ball games, the Seminoles covered their faces in red dirt, which they believed made them look like giants and brought good luck. For this dance, the medicine man, would lead and also blow into an ox tail causing it to inflate and pop and was treated as some sort of medicine for players before the ball game, before they tied tails on them to wear while they played. With the Corn Dance, while acting as song for harvest and a tribal gathering, it also serves as a song of punishments of those crimes that went without justice. Seminole music has strong ties to the natural world and often, the themes revolve around nature itself. In all cases an understanding of reciprocity and “giving back” is understood, even going as far as the literal punishment taken for misdeeds by Seminoles (Densmore). The themes in Seminole music encapsulated an idea of giving back and equalizing with nature, being one and understanding; not just reaping. The Seminole music and ritual performances were representative of this ideal. Densmore, Frances. Seminole Music. Washington: U.S. Govt. Print. Off. , 1956. Pages 168-175, 186. The most significant religious event is the Green Corn Dance. This ceremony is a religious renewal and fasting that the Seminole tribes and other Native American tribes go through. The ceremony process is carried out in different ways and at different times of the year with each tribe. Information about this ritual done by the Seminole tribe has been unknown until the 1950s when a few white men witnessed the ceremony. The Seminole Green Corn Dance is a four day ceremony that occurs from late April to mid-July and takes place at the tribe’s dance ground. The first day includes cleaning the grounds and collecting fire wood as well as a ceremonial bath. A dance around the fire occurs at dusk. The second day is dedicated to eating foods provided by the women, playing ball, and dancing. Fasting day happens on the third day, and is under strict guidance of the medicine man. This is when men take the black drink and admit their sins during the year, which are then forgotten and the man is renewed. The actual Green Corn Dance is held at midnight of the fourth day and continues throughout the night. This is an important day for young boys as they receive their new names and go through a bloodletting ritual to release bad blood. The entire ceremony concludes by the afternoon as people start to head home. Another spiritual ceremony performed is the Stomp Dance, which is for both religious and social reasons. It takes place on a square mound with a fire pit in the center surrounded by family camps. There is a Meko or “king” that is the head of the ceremony and is accompanied by the chief medicine man and the speaker. There are many rounds of dancing that are four songs each, which are sung in call and response form. Round after round dancers are called by the medicine man to enter the dance circle. Hundreds of dancers will end up in the circle as they shuffle and stomp the night away. All participants must be partnered with a female to carry the rhythm. The religious part of the ceremony involves fasting at midnight before the dance and touching medicine four times throughout the night. Medicine helpers gather the special roots and plants for the medicine man to prepare before the dance. Members of the dance take the special plant for physical and spiritual advantage. Seminoles were not introduced to Christianity until the late 1840’s. The Seminole tribes in Oklahoma were targeted by Baptist missionaries and were converted to Christianity. Baptist and Methodist faiths are most common. In the early 1900’s Creek Baptist Indian missionaries from Oklahoma came to visit the Florida Seminole tribe in Indiantown. Some were baptized and started Christian groups which eventually led to the First Seminole Baptist Church in 1936. However, as Christianity began to spread traditional rituals, such as the Green Corn Dance, started to decline. This caused disturbance amongst the tribes and some began to view the new religion as a threat. In present day, tension between the two have decreased and the traditions are still practiced. Weisman, B.R. (1999). Unconquered People:Florida's Seminole and Miccosukee Indians. Gainesville: University Press of Florida. Native Americans consider music to be a gift from the Creator. The Seminole tribe is a part of the Southeast Woodland region, which helps differentiate the different style and characteristics of their music from other Native American tribes. Their music generally consists of vocals in medium and high ranges with vocals pulsing at the ends of the phrases in particular. The melodic pattern tends to descend gradually throughout the songs, and the metric frequently changes with close relationship to the specific ritual dance or ceremony. The songs performed by the Seminole tribe have a wide variety of rhythmic accompaniments on the drums, including the small hand drums, water-drum, and the cypress knee drums. Other important instruments that play a major role in the framework for the Native American’s music, in particular the Seminole tribe, are the coconut shelled rattles which are similar to the gourd rattles of other Native American tribes and the flute. For the Native American, the songs performed were traditionally the chief’s way of communicating with the higher powers, and the music was rarely performed just for any reason. The music of the Native Americans were performed for specific purposes such as success in battle, bringing of rain, success in hunting, or songs to help treat the sick. These songs were either handed down generation by generation, received in dreams, or would reveal the influence of the European culture in the modern songs. A very interesting detail to note is that the music among the Native American Indians is essentially a man’s occupation and he is the one who performs these ritual and ceremonial songs. Each song is sung differently and performed for definite results. One thing that the Seminole tribe incorporates in their music that is not really seen in other tribes is the use of call and response. The songs for success in hunting are without accompaniment of instruments and are sung in succession, not in sets of four. The leader sings the first phrase, then pauses while the men repeat the phrase, after which they all sing together. The Cow Creek Group used certain melodies for treating certain illnesses or conditions. Also, some medicine songs consisted of four sections, in which three were repeated, and the tempo changed in relation to the words being sung. The use of the four sections is one form of melodic and rhythmic characteristics that are often used in many of their songs in the Middle West where the Seminoles went to settle. The Seminoles are very private people and are seldom interviewed so there is very little information on the different styles of the music they performed during their rituals and ceremonies. It has taken years of friendship and building of trust for the first recordings of Seminole music to take place. Based on the rising popularity to study and learn about Native American music, specifically the Seminole tribe, the conclusion shows that Native American music is mainly melodic with no harmony and the occasional singing between a soloist and chorus. Florida Historical Society. "Music of the Seminole." JSTOR7.2 (1928): 155-158. Print. Burton, Bryan . Moving Within The Circle. Danbury: World Music Press, 1993. Print. Densmore, Frances. American Indians & Their Music. New York: The Womens Press, 1926. Print. Densmore, Frances. Seminole Music. New York: De Capo Press, Inc., 1972. Print. Society for Science & the Public. "Seminoles Not Un-Musical but Have Kept Music Secret." JSTOR 21.570 (1932): 167. Print. Instruments of the Seminole tribe include varied types of rattles, drums, and flutes. The type of instruments and their individual uses by the Seminole tribe depend on what event the music accompanies. For example, the Seminole tribe partakes in numerous dances, festivals and ceremonies such as the annual Corn Dance held in June and the Hunting Dance held in September, which involve different arrangements and specific uses of instruments and singing. One of the oldest Seminole instruments is the rattle. Rattles are made and used in a few different ways depending on the context in which they are used as well as the period in which they were created. The coconut shell rattle has proven particularly important historically for the Seminole tribe, who used these instruments during their numerous social dances. The coconut shell rattle "consists of a coconut shell, pierced by a stick and containing the seeds of the Canna flaccida Rosco." During the annual Corn Dance and other ceremonial dances, women in the tribe strap these rattles to their lower legs and dance, causing the rattles to shake. Previously, rattles were made from a variety of other materials including the shells of small box turtles with sun-hardened pieces of mud in the center to create the rattling sound. More recently, the Seminoles have used tin cans as rattles for the same purpose in their dance ceremonies. Though rattles are the predominant instrument in the ceremonial music of the Seminole tribe, a few types of small drums are used to accompany the different types of music of the Seminoles, as well. These drums include small hand drums, a larger "cypress knee drum," and a "water-drum" for events such as the Corn Dance, the Stomp Dance, and the songs of the ball game, respectively. Originally, water drums were made with cypress bark and buckskin, but more recently have been created from tin cans. Another group of traditionally influential instruments involved in Seminole tribe music were wooden flutes; however, use and creation of these flutes is rare in present times as many of the Seminole people no longer recall how to make or even play these instruments specifically, though some recall their use in earlier times. The design of their flute is peculiar in comparison to other Native American flutes as the headpiece is detached from the cane used to make the body of the flute. The headpiece is then tied on with a buckskin thong. Other features of their flute include the drilling of four, unevenly spaced, beveled finger holes that allow the flautist to cover the holes completely. "…Its outstanding peculiarity lies in the boring of two holes transversely through the cane at right angles to the sound holes and equally distant from them." The flutes may also be "made of a joint of reed or the tibia of the deer's leg." Beyond flutes, there have been intimations of the previous use of wooden recorders by groups of East Coast Indians and possibly the Seminole tribe. Densmore, Frances. Seminole Music. Washington: U.S. Govt. Print. Off. , 1956. 38-41. Print. The modern Seminole Indians of Florida are a very proud tribe that takes great pride in their music as well as other traditions. They have many songs and dances that have been passed on for generations. A lot of times these songs are used for particular activities such as hunting, playing ball, or special rituals. The modern Seminole Indians were making most of their music in the 1950’s which is very modern considering that Indians have been in America for 12,000 years and Europeans have only been here close to 500. The Florida Seminoles have 243 songs! The majority of these songs were written by Billie Stewart who wrote 153. His name doesn’t sound that much like a Native American but the other musicians names are very cultural such as Panther and Susie Tiger. Panther wrote the second most songs with an impressive count of 63. One of Panther’s main songs was the hunting dance song. This song was made to have a downward progression of a major triad combining with a minor triad. There is a short phrase that is only repeated three times throughout the song. Panther would also sing when the sick were being treated. He was allowed to do this because he knew many of the Medicine Man’s remedies because he spent a lot of time with him but he refused to ever be a full time medicine man because that required too much meditation and solitude. While treating the sick there was never a set melody but more of talking with occasional higher pitched notes. The Calusa Indians never sing when sick people are being treated. Another type of song the Seminoles have always used is the Children’s dance song. The only instrument used is an old fashioned rattle. The beat is very slow which surprises me because it is a dance song that they usually have fast beats for. There is a swing in the beat caused by a quadruple measure, but there are no pauses in the song. This song is used any time usually during the day when the tribe is in a happy mood. The most interesting song for me that the Seminoles use quite often is their Hunting Song. They sing this the night before a big hunting trip and it is believed to draw the animals in closer and to make them easier to find. While singing the song they do a ritual around a fire which consists of throwing a special tobacco plant in the fire to cause a lot of smoke. They then hold their hands and guns over the smoke to gain good luck while they sing the hunting song. The hunting songs are not sung in succession they are sung by the leader singing a phrase then the rest of the mean repeating it together. One of the greatest examples is the Annual Seminole Tribe Fair at the Hard Rock in Hollywood, Florida. The three-day festival has been going on for forty years, and honors the Seminole Tribe by showcasing their history, song, dance, foods, storytelling, arts and crafts, pow-wows, and other customs. Between the three days, there are over fifteen different types of music and dance related performances, including warrior dances, traditional flute playing, and modern Seminole blues band like Paul Buster and the Cowbone Band, and Hank Nelson. Another modern example of the Seminole Tribe’s music is the Native Music Rocks Tour. Founded by the Hard Rock International and the Seminole Tribe of Florida, the yearly tour, which began in 2008, was created to support Seminole (and other Native American) music and artists. The tour features different performers including Grammy and other award-winning artists who perform rock, blues, jazz, and pop. Their goal is to show the world that Native Americans know how to play more than just a flute or drums, and they want their music to be recognized worldwide. The Seminole Star Search program is another modern twist on Seminole music. Sanctioned by the Seminole Tribal Council, it is a summer program that tours throughout Florida to find the most talented Native American performers, from flute players, to other instruments, to singing and rapping. Their aim is to promote showcase the diverse kinds of musical talent that Seminole Country has to offer, and at the end of each summer, winners are selected and featured all throughout the Seminole community. Many of the winners from this competition participate in the Native Music Rocks tour and get to travel the country to spread their heritage, and twist on traditional Native American music. The three of these events and programs are just a few examples of how Seminole Music has found a modern touch into the twenty first century American ways. While they do still maintain a traditional approach with many of their people, it is a common misconception that they are sheltered and do not embrace today’s cultures and lifestyles.